Bearing the tagline “We still have a lot to cover,” Apple’s latest media invitations have been sent out, and they’re for the rumored iPad 5 event now confirmed for October 22nd. So it’s pretty much a given that the ultra-slim, iPad Mini-following form factor iPad 5 will be the main announcement. You can also expect to see the iPad Mini 2, likely with a retina display. What else might Apple announce? Well, if this is their last media event of the year, there are still several products to cover before the holidays. Products like the cylindrical Mac Pro, which we still need final details and a release date for. Apple TV has been rumored for an upgrade all year, and while most pundits believed it would come about at the iPhone 5S/5C event, that didn’t happen. So that could be on the table for this event. And pretty much guaranteed to put in an appearance is the release date and pricing for OS X Mavericks — news that I expect Tim Cook to lead off the event with. Apple hasn’t updated its MacBook Pros yet this year, so we’re due for that, too. Pie-in-the-sky possibilities: iWatch and iTV. Hey, we can dream. What about the invitation artwork and tagline? Any hints to glean from that? 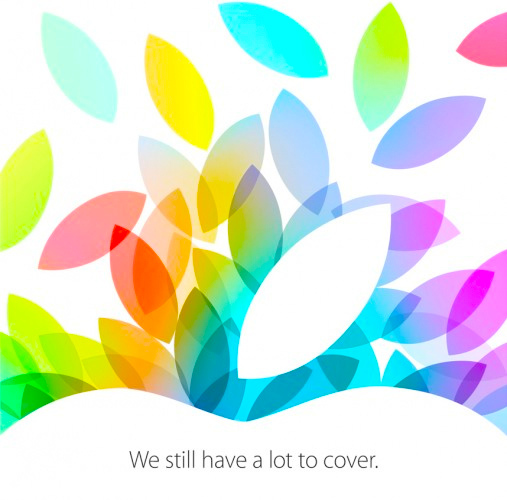 Umm… The word “cover” suggests new iPad covers, maybe. Okay, I’m reaching. This is probably one of the rare few occasions when Apple marketing/PR department is simply being literal.